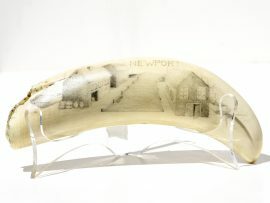 ‘Lone Wolf Howling’ black and white scrimshaw on huge ancient walrus tooth by David Adams. Call of the wild depicting a howling wolf during a Harvest Moon. Excellent stipple work by Adams on this one. This is a monster size walrus tooth, by the way. Decades ago one could come across ancient walrus teeth of this size, but not now. This is from a group of ancient walrus teeth that we collected decades ago. Once they are gone, there will probably be no more of this caliber around.